This is what I hope will be the first in a series of blog posts about our visit to Australia to visit emigrant daughter, Carla. In this first post I focus on Australia's amazing wildlife. I hadn’t expected to find myself in a land where the native animals would be such a huge part of our holiday experience. I dream of some day going on safari to Africa... to wonder at the big cats, elephants, rhinos etc. But I hadn’t expected to find the same thrill down under – naivety and ignorance on my part no doubt. ue. Nah, they were entirely indifferent. They also walk funny. When bent on where they are going, they zoom along on their back legs with help from their tail. 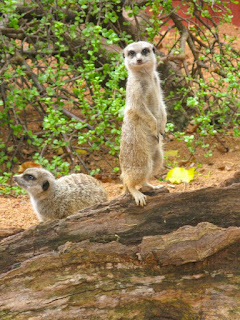 But when just cruising around they kind of crawl – using their ‘hands’ also... making them look fierce awkward. 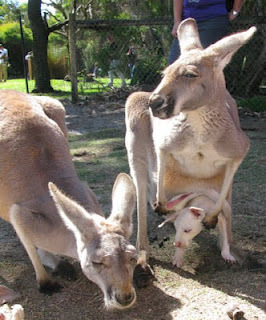 The other weird thing is seeing mammy roos with babies in their pouches... sometimes upside down so it’s just a pair of little roo feet that protrude! I can’t imagine how suffocating it must be to have your little head stuffed into your mammy’s pocket when the temperature is 35 degrees! But for me the highlight of Cavesham was meeting a Koala. I have always been unmoved by Koalas. They look so cuddly but seem to have no personalities. 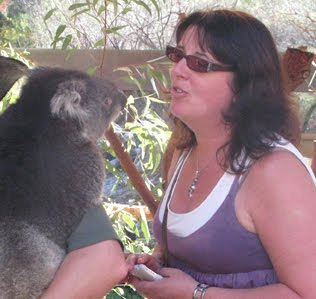 But when I caught the eye of a keeper and charmed him (yeah – round of applause please for the ole wan still able to occasionally charm someone) into letting me talk to his Koala I was smitten. Her name was Karen and like all Koalas she spends 80% of her time asleep and the rest eating Eucalyptus leaves which seem to induce them into a kind of blissful trance. I stroked Karen’s back and she looked into my eyes and what can I tell you..... we connected..... on some level beyond physical communication. I am sure she still thinks about me! I hope she is well. An exhilarating ride later and sure enough we found a pod of about ten dolphins who were all up for some craic. After watching them swim around and under our boat, Skipper then announces that we are going to see if they really want to play. “Can everyone move to the back of the boat so we can ride really fast and create some waves.” We all hung on as we shot through the water at high speed... “look out the back” the skipper called. 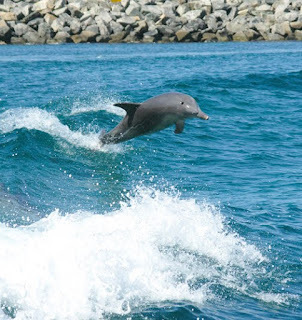 We all turned around and there behind our boat were the dolphins surfing the waves we were creating and jumping out of the water and clearly having a great time. It was sublime joy – for them and for us. “If no one is in a hurry back, let’s do that again” says the captain. Not surprisingly no one objected. It was magical and emotional.... the sheer joy of living that these dolphins exhibited was infectious. The sad fact is that dolphins in captivity – you know the ones in the dolphin shows in theme parks etc - on average live for about ten years. 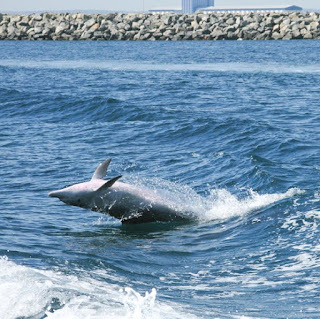 In the wild a dolphin will generally live to be about 45. I ask you to consider this before you visit a dolphin show! Every so often I get to interview someone who really fascinates me with their particular stories or expertise. Recently I travelled out to Glasnevin Cemetery to talk with historian and chief tour guide, Shane MacThomais who enthralled me with stories and facts about Glasnevin and other graveyards in Dublin. MacThomais has written a book, called Dead Interesting, describing stories of the rich, famous, infamous and ordinary citizen and which is well worth a read. He also told me that gravediggers are (to his knowledge) all men - the last bastion of male dominance, perhaps. Gravediggers also "to a man" wish to be cremated! And did you know, that certainly in Glasnevin buying a plot is all about 'location, location, location'. My interview with Shane is now up on the writing.ie website and you can read it here. Normal service shall be resumed if I return from down under! !